Head to Baur’s on June 11th for a soulful jazz performance by local musician Wellington Bullings. Her sultry voice captures the essence of jazz & soul, and her poetic lyrics bring something refreshingly unique to her compositions. Music Appreciation Society invites you, your friends, and family to experience this intimate performance at Baur’s Listening Lounge. With a Jamaican cultural background, Wellington grew up in a household that was always brimming with the delicious sounds of Calypso, Jamaican ska, Reggae, and Afro-Cuban music. Her exposure to these many genres sparked her passionate love for singing. Wellington has spent many years going deeper into her musical studies, to refine her signature sound. 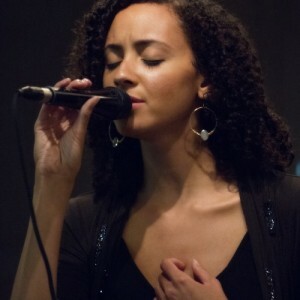 Each of her songs are deeply rooted in jazz, soul, and are drenched with Latin influence. Her musical style can be described as; sophisticated, sensual, soulful, and deeply introspective. As a former student at the prestigious Berklee College of Music in Boston Ma, Wellington performs actively in her hometown of beautiful Colorado. She has just released her first EP of original music, and is currently working on a full length album. This special appearance at Baur’s Listening Lounge is sure to delight music lovers of all ages. Music Appreciation Society invites you to come early for dinner and drinks and stay for the sensual and soulful sounds of Wellington Bullings.